In August 2014, I visited Ethiopia as a guest of Concern Worldwide to see the work the charity was carrying out in the north of the country, as well as to get a sense of Ethiopia 30 years on from the famine that brought the country to global attention. An edited version of this article appeared in The Irish Post last November. All photos by Petterik Wiggers. It’s been more than 30 years since Nuru Ibrahim has seen his sister. He was seven years old when she left his father’s farm in search of food, never to be seen again. To this day he has no idea what might have happened to her. Ashetu’s assertion is undeniably true. Ethiopia may still be one of the world’s poorest countries, but it has steadily improved in the three decades since Bob Geldof and the world were shocked into action by the 1984 humanitarian crisis. Some of the change it has undergone has been remarkable. It has come about, in part, due to Chinese investment, a huge influx of charitable, non-governmental organisations (NGOs), and a change in political ideology that has brought with it some form of stability. Ethiopia has been a democratic republic since 1991 when the Ethiopian Peoples’ Revolutionary Democratic Front (EPRDF) overthrew the Derg, a military dictatorship that had been in power since toppling Emperor Haile Selassie in 1974. The EPRDF have not relinquished power in the 23 years since and, although this has drawn no little criticism, few can dispute that the ruling party has presided over a period of remarkable economic progress. One 2013 study even found that Ethiopia is creating millionaires at a faster rate than any other country in Africa. The country that had become synonymous with starvation is now considered the darling of the development community and one of the fore runners of the burgeoning ‘African Tigers’. Over the past decade Ethiopia’s GDP has shot to an average of more than 10 per cent in a region where growth is little more than five. With its millennium development goals largely on-course, the government has lofty aspirations to make Ethiopia a middle-income country by 2025. Although such plans may be ambitious, the political desire is evident in the rapid infrastructural changes taking place across Addis Ababa, the country’s capital. Addis offers a chaotic introduction to the country. Here the hum and hammer of construction work is constant. From 6am it begins as cranes swing in and out of action giving rise to office blocks, international hotels and new apartment blocks. Along the eastern side of the city, never-ending rows of corrugated iron fences shelter concrete skeletal building frames where construction workers busily hurry up shoots of bamboo scaffolding. The city’s arteries are also in flux. Concrete paved streets, without warning, morph into mud tracks as old roads are dug up to make way for imminent new interchanges. The city’s biggest infrastructural project is an impressive light rail system that has the potential to dramatically alter the working lives of Addis’ citizens. Due to open in mid-2015, the incomplete sections of the rail overpasses are the first thing to catch your eye upon leaving the airport. Emphasising how dramatic rapid change is hitting Ethiopia, the huge swathes of concrete overhead have an almost futuristic quality in this third-world capital. Awagu Ali, 25 years old. 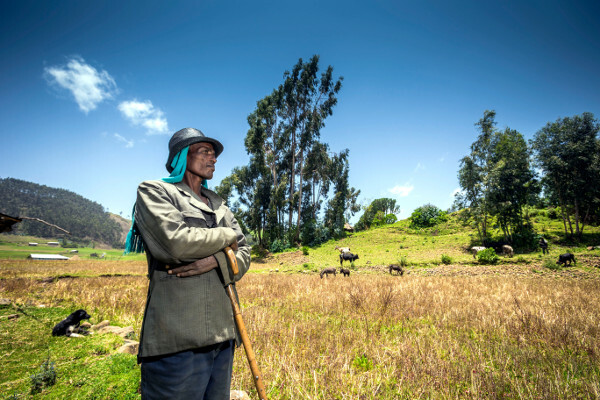 Wollo is known for the famine in 1984, when close to a million people died during a food crisis. Clues to what is fuelling this change can be found in the airport’s arrival hall and departure lounge. Chinese faces are everywhere as flights arrive in and out of Addis from Beijing, Shanghai, Guangzhou and Hangzhou. So dramatic has been the increase in China’s capital investment in Ethiopia that some estimate it has doubled in the past five years to more than $2billion. Local children have become so accustomed to seeing Chinese faces at work on roads and other infrastructural projects that the call of ‘faranji’ – Amharic for ‘foreigner’ – has been replaced by one of ‘China, China’ at the sight of any white faces. Why China has taken to Ethiopia is unclear, although the country’s stability and young workforce are doubtlessly an attraction for Chinese companies tracking cheap labour. That Ethiopia also follows a similar tightly controlled, state-heavy economic model to that of China has no doubt also curried favour. The similarities don’t end there either. Like China, the Ethiopian government has been on the receiving end of strong international criticism from human rights groups over alleged abuses. There is disturbing evidence of a policy to jail journalists who are critical of the government. Last March, nine journalists and bloggers were arrested and charged with “terrorist” activities. Several more were jailed in 2012 under the same offence. There are further parallels when it comes to the EPRDF’s treatment of their political opponents. Of the 547 MPs resident in Ethiopia, only one is in opposition. The rest of the opposition is in exile, afraid to return for fear of political persecution. There is some evidence to justify their fears. Last June, Andargachew Tsige, secretary general of the exiled party, Ginbot 7, and a British citizen of Ethiopian origin, was illegally seized in a Yemeni airport and extradited back to Ethiopia. He is being held in the country under terrorism charges and could face the death penalty. Tsige’s case has been highlighted by Amnesty International, who have also claimed that the Ethiopian authorities have been involved in the unlawful killings, torture and enforced disappearance of some of the country’s largest ethnic group, the Oromo people, for suspected links to a rebel group. The government has denied the allegations and accused Amnesty of trying to tarnish its image. Ibrie Seid, 32 years of age. International image is something the Ethiopian government is keen to preserve. Amid the commendable economic advances, it is unsurprising that the government is keen to focus on its present rather than its past. Famine is very much the F-word in a new Ethiopia wishing to fashion a growth narrative that will attract investment, instill confidence and generate tourism. Yet amid the changing façade is a familiar picture of extreme hardship. Despite its apparent progress, Ethiopia remains a country of stark poverty, highly reliant on developmental aid. Just this year, an Oxford University Study ranked the country as the second poorest in the world. Although the economy has swelled, it has been matched by phenomenal population growth. In 1984, Ethiopia’s first official census recorded a population just shy of 40 million. A quarter of a century later, that figure had doubled to 80 million, largely due to a drop in disease-related mortality rates as well as surging birth rates. Today, Ethiopia’s population stands at 94.1million with the general consensus being that that figure is expected to double in the next 25-30 years if current growth rates remain. This staggering increase has put further pressure on a predominantly rural population reliant on agriculture. Competition for arable land is fierce. Those without it have flocked to Addis, in hope, while the rest remain susceptible to climate-related food crises such as drought. In the three decades since the 1984 famine, the country has teetered on the brink of hunger on a number of occasions. As recently as 2009 there were reports of an imminent famine. Although that was averted – amid government complaints of international misreporting – food emergencies are an annual reality for Ethiopia’s poorest, particularly in the rural areas, where some 300 NGOs, such as Concern Worldwide, are continuing to work. This year, Concern marked 40 years in Ethiopia having first arrived in response to the 1973 famine. 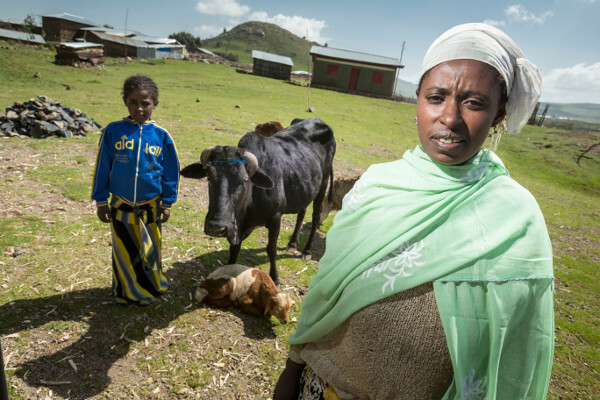 Over the past seven years, their work has taken them to Dessie Zuria, one of the most critically food insecure woredas (districts) in Ethiopia, where drought is a constant problem for a population almost entirely dependent on rain-fed agriculture. The mountainous terrain – comparable in parts to the West of Ireland – is largely unsuitable for agriculture with the high altitude (upwards of 2,700m) also restricting the type of crops that can be grown. Farmers have largely been reduced to producing only barley, which has increased their vulnerability to food crises and hunger. Unsurprisingly, their diet is severely lacking in nutrition. The rate of chronic malnutrition runs at a staggeringly high 54 per cent – 10 per cent above the national average. Yet, Concern is making its mark in Dessie Zuria and part of the solution has been something typically Irish – the humble potato. 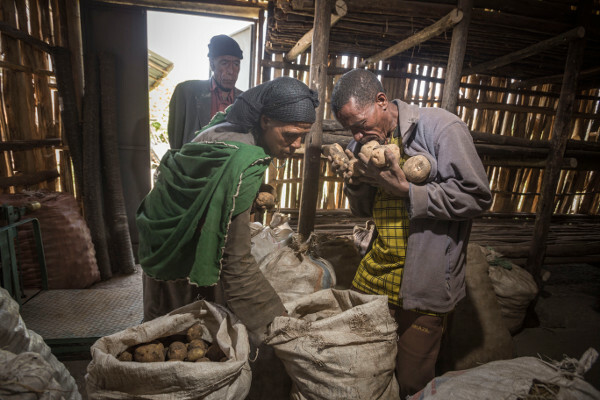 Previously unknown in the Amhara region, potato is helping to transform the lives of thousands of the poorest farmers. Ibre Seid, a 32-year-old farmer, is one of those. He has been producing potato for five years having previously never even seen one. “I didn’t know potato. I didn’t have any idea about it before,” he says with a smile and a shake of his trilby. “The Concern extension worker kept coming around our houses to tell people about potato and nobody believed him. He gave me one quintal of potato seeds, which I planted in June. I didn’t really believe that it was going to be of any use.” Then came the surprise. On the same plot where he was growing one quintal (100kg) of barley, Ibre yielded 15-20 quintals (1500-2000kg) of potato in one year. Concern started the potato pilot project in Dessie Zuria with 16 farmers. Seven years on, there are now more than 10,000 farmers in the woreda benefitting from potato. The aim initially was to show the locals the benefits of crop diversification. As well as potato, they were encouraged to grow apples and pears in a bid to effectively provide them with a back-up plan if drought failed their barley production cycle. Its success hasn’t been lost on the government who are beginning to roll it out in other areas in a bid to increase community resilience. For Concern, the project is part of a wider integrated development programme being implemented in Dessie Zuria and nearby Delanta. Concern is also helping these highly impoverished communities with small-scale irrigation, the provision of clean water, health education, watershed management, child-feeding techniques, and the economic empowerment of women through self-help groups and the establishment of local financial co-ops. Endalamaw Belay, who has worked with Concern for 15 years, is convinced that this kind of integrated strategy can go some way to eradicating extreme poverty. “If you knock on the door of one of the house holds in Dessie Zuria you could find health problems, water and sanitation problems, food problems, inequality problems and more problems,” he tells me in Kombolcha. “If you focus only on solving one problem – agriculture or health or inequality – you can’t bring any significant change because one contributes to the other. To overcome this multi-disciplinary problem, an integrated approach is very important. Back in Addis, Kate Corcoran, Concern’s country director in Ethiopia, and a native of Fethard, Co Tipperary, echoes Belay’s sentiment. She believes that Concern has helped pave the way for the government to now roll out the programme across the region. As Concern mounts another ‘Hunger Stops Here’ funding drive and the return of Bob Geldof’s Band Aid reminds people of Ethiopia, I put it to Corcoran that some in the western world might question why, after 30 years of aid, Ethiopia still has a problem with hunger. Will Ethiopia be any different in another 30 years?